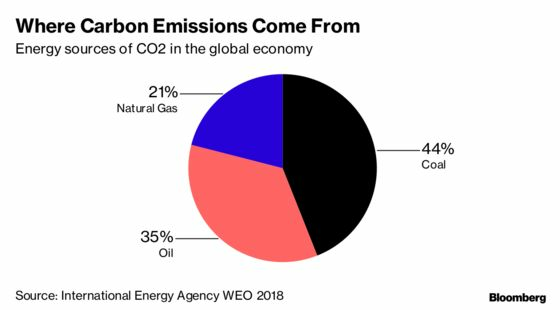 (Bloomberg) -- With insurers shouldering a record $160 billion in climate-related losses from last year alone, a group including 30 central banks called for measures to spur green finance and better assessment of the risks from higher global temperatures. The move led by the Bank of France, Bank of England and People’s Bank of China draws the group deeper into a controversial area of policy-making where they advocate funding for alternatives to fossil fuels. They set out a road-map for authorities to use in prodding executives and investment funds to weigh up the impact global warming will have on portfolios. The U.S. Federal Reserve and Banco do Brasil were the most prominent institutions not involved in the initiative, reflecting doubt about climate science voiced by Presidents Donald Trump and Jair Bolsonaro. For the central banks involved, which represent most of the world’s biggest monetary policy makers, the need for action is increasingly pressing. Injecting climate-related risks into the monitoring of broader financial stability and threats to the banking system. Using sustainability criteria to shape the portfolios of assets maintained by central banks. Identifying areas where more data is needed to describe threats coming from environmental issues. Prodding financial market participants to better disclose climate-related risks, an effort that builds on the Group of 20 nations’ Task Force for Climate-related Financial Disclosure, known as TCFD. Developing a “taxonomy” of economic activities, or a common vocabulary for policy makers and companies to use in assessing climate-related impact on finance. The measures are aimed at building awareness about the potential losses as global temperatures increase, making storms more powerful and weather less predictable. It’s also seeking to encourage funding for greener projects that would reduce emissions and make renewables more affordable. “If some companies and industries fail to adjust to this new world, they will fail to exist,” Carney and Villeroy said in a Guardian newspaper article on Wednesday. They warned that a “massive” reallocation of capital was necessary to prevent global warming, with the banking system playing a pivotal role. 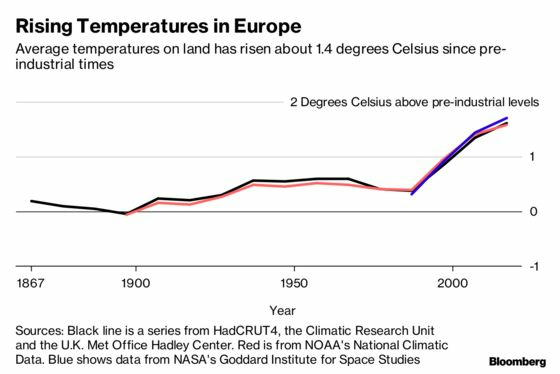 The report marks the first time that such a large group of central banks has set out the links between rising temperatures and risk to the economy. It pointed to research done both by academics and financial institutions quantifying the threat and said climate change is “a source of financial risk” that falls well within the mandate of central banks and regulators. 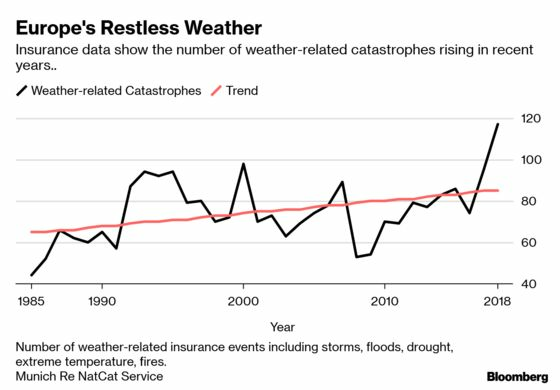 One notable finding attributed to Munich Re showed annual costs for natural disasters topped the 30-year average of $140 billion in seven of the past 10 years -- and that the number of extreme weather events since 1980 has tripled. A study in Nature Climate Change showing a 2.5 degree Celsius (4.5 Fahrenheit) increase in temperatures would leave 2 percent of the world’s financial assets at risk. Munich Re’s natural catastrophe review showing $160 billion in losses in 2018 from events including wildfires, extreme storms, drought and heat waves. A paper on creating green bond markets from the Sustainable Banking Network. A report from the Organization for Economic Cooperation and Development suggesting low-carbon finance may result in $5.6 trillion of securities outstanding by 2035. A paper by the International Energy Agency and International Renewable Energy Agency suggesting losses in the energy transition may top $20 trillion. The NGFS was formed at French President Emmanuel Macron’s “One Planet Summit” in December 2017, an event that marked a contrast to resistance by the U.S. under Trump to addressing climate change. With the U.S. reluctant to discuss the issue, work by the G-20 and TCFD stalled. Villeroy proposed the NGFS as a “coalition of the willing” central banks to press forward on the issue. China has been a key participant. 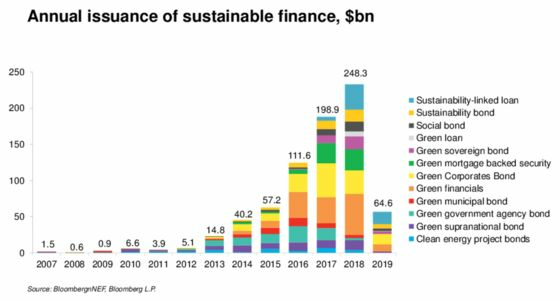 Its institutions have issued more than $100 billion in green bonds from 2016 to 2018, making it one of the biggest markets for the securities in the world. The NGFS report said green loans held by the 21 largest commercial banks in China reached 8.23 trillion yuan ($1.2 trillion) in 2018, accounting for 10 percent of their aggregate loan balance. Chinese authorities were first to set down definitions for green loans and green bonds, the report said.